A few nights ago I got to do something incredibly cool: I moderated an almost hour-long Q&A with directors Joe and Anthony Russo at IMAX headquarters in Los Angeles after our screening of Captain America: The Winter Solider. If you didn’t know, we recently launched our year-long screening series that will focus on both classic and new IMAX films. The goal is to show a film every month at an IMAX theater with a filmmaker Q&A and, when possible, do a meet-and-greet after the screening for attendees. 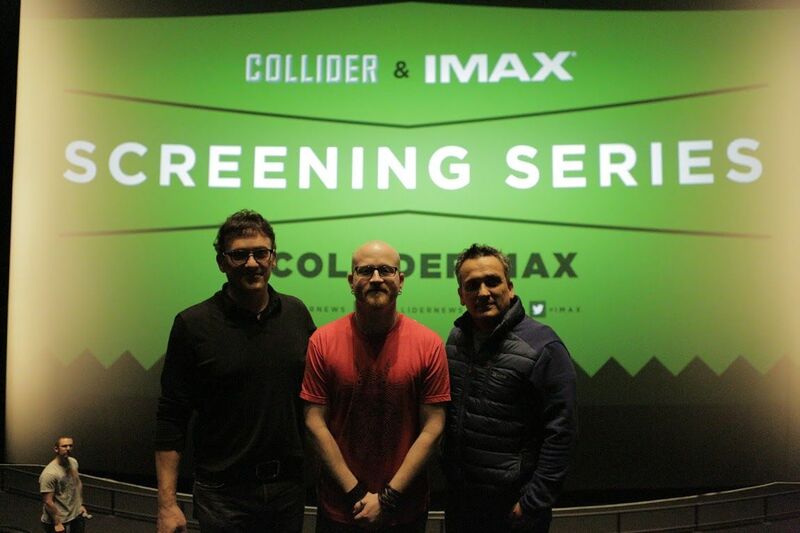 Anyway, last week at IMAX HQ Joe and Anthony Russo showed up a good hour before the screening to check out the new state of the art theater and say hi to everyone. Yes, even though they must have seen Winter Solider a thousand times, they still sat through the screening to watch it with the fans and to check out the new IMAX theater. Shortly after the screening ended they sat down with me for an awesome Q&A. Unlike some post-screening conversations where you have a finite amount of time, the Russo’s were up for anything and I was the one who had to end the Q&A so everyone in the theater could participate in a meet-and-greet where fans got posters signed and could talk to them face-to-face. 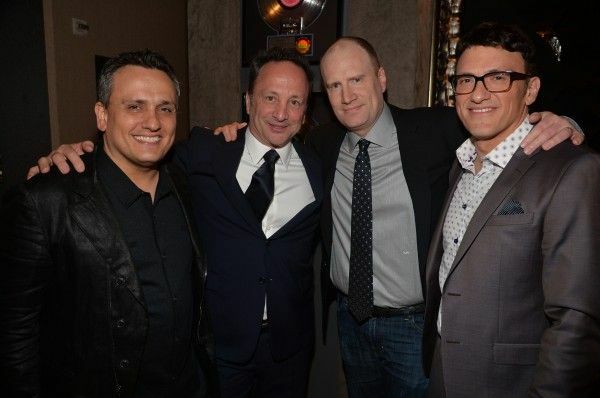 It was an awesome night and I can’t thank the Russos enough for being so cool with everyone and doing this screening. During the wide-ranging conversation they not only talked about Captain America: The Winter Solider, Captain America: Civil War, and Avengers: Infinity War – Part 1 and 2, they also talked about the behind-the-scenes maneuvering to land Spider-Man in Civil War and why we haven’t seen him in the marketing yet, told great stories about making Winter Solider including working with Robert Redford, why Anthony Mackie says “cut the check” after some of his takes, the importance of finding interesting ways to deliver needed exposition, where they are in the editing process of Civil War, if they will really have sixty-seven characters in Infinity War, why they’re shooting all of the two-part Avengers movies with IMAX cameras, the way they work with screenwriters Christopher Markus and Stephen McFeely, what it’s like to work for Marvel, getting into the cosmic universe with the upcoming films and bringing a naturalism to the cosmic side, and so much more. If you’re a fan of Marvel movies or the Russo brothers, I promise you want to watch the full interview. Check out the full Q&A below and look for our February IMAX screening announcement very soon. Let me know what you think about the Q&A in the comments below. The questions that were asked are listed below the video. Finally, if you missed our IMAX Q&A with director Francis Lawrence after our Hunger Games screening last month, click here to check it out. 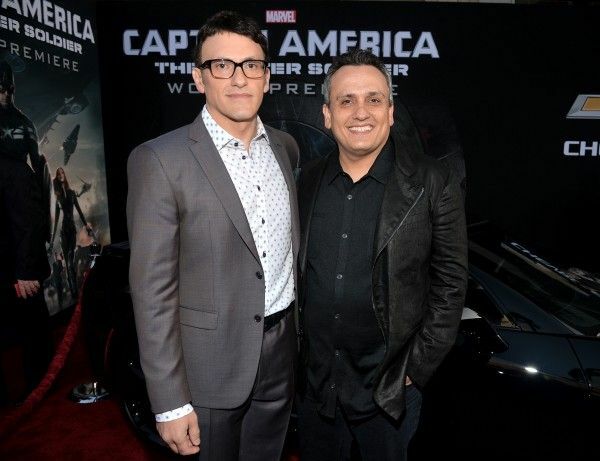 01:16 – Joe Russo on playing a doctor in Winter Solider. 01:51 – Did they fight over anything while co-directing the movie? 02:59 – On working with Robert Redford; when he cooked for them. 05:00 – Finding their way in the industry with help from Slamdance; Redford is very lo-fi and traditional. 06:37 – Delivering exposition, particularly in the bunker scene and the Zola scene. 10:20 – Working on the action set pieces and making sure they stand out. 12:15 – What they took away from the critical and commercial success of Winter Solider that they brought to Civil War. 15:25 – Will Civil War be a darker movie? 17:15 – How did they react when they found out they were going to get the opportunity to include Spider-Man? 19:05 – The status of Civil War; where are they in the editing process? 20:15 – They’re finishing up the score with Henry Jackman. 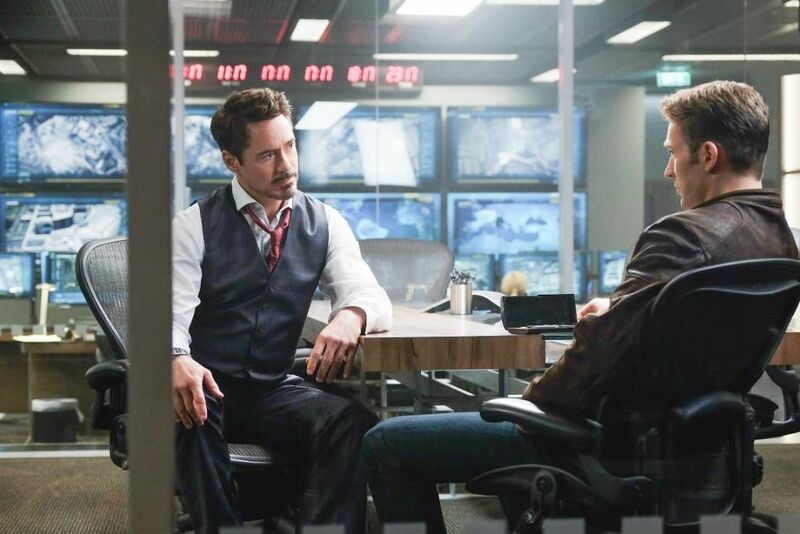 20:48 – Have they filmed their Civil War post-credit scene yet? 20:56 – Will there really be 67 characters in Infinity War? 23:01 – Where and when they’re filming those movies. 23:58 – Where are they in the scripting process and who will shoot Infinity War? 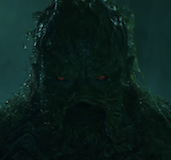 24:26 – Any chance we’ll see a Netflix character pop up in the films? 25:03 – The choice to shoot Infinity War with IMAX cameras. 26:10 – Incorporating important character beats within big action sequences. 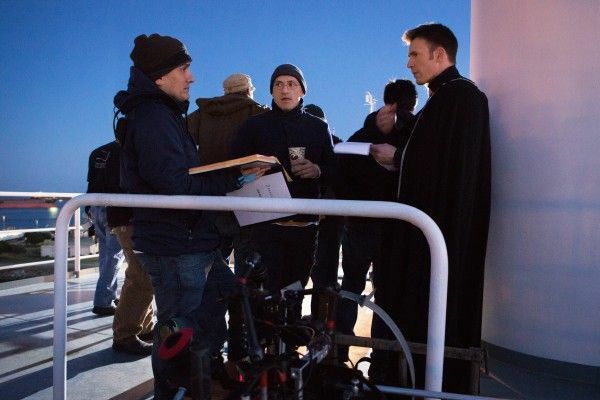 27:48 – On working with Christopher Markus and Stephen McFeely. 30:23 – How they made the connection between Winter Solider and Agents of S.H.I.E.L.D. so seamless. 31:53 – What they know about Doctor Strange. 32:36 – Do they work with the other Phase Three directors? 34:40 – What does “cut the check” mean? 35:28 – Is there a particular character that they’re most excited to incorporate in one of their upcoming movies, especially having been fans of the source material as kids? 37:26 – Do they know when they’ll unveil what Spider-Man looks like in Civil War? 37:59 – On the deal made between Marvel, Disney and Sony to use Spider-Man. 40:36 – How do they manage all the different departments and why Marvel is such a great team to be part of. 43:00 – On getting into the cosmic universe with the upcoming films; bringing a naturalism to the cosmic side. 45:40 – Is there anything about Winter Solider they wish they could change after seeing it again? 46:57 – The Easter egg you might have missed in the cemetery. 49:37 – Would they ever “fix” Fantastic Four if they had the chance? 49:27 – The challenge of dealing with rights issues; passion for the material versus passion for money. 50:37 – On the score of Winter Solider; their collaboration with Henry Jackman. 55:52 – Will they ever do anything with Serpent Society?